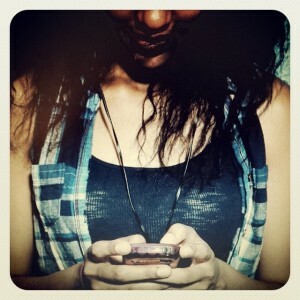 Excessive texting leads to a forward head position. With the advent of smart phones, tablets and laptops allowing us to be constantly connected no matter where we are, young and old have adopted a hunched-over position over their devices. As our bodies adapt and accommodate to this abnormal position, it results in a forward head position which straightens the curvature of the neck, shrugs shoulders and leads to a hunched upper back. This abnormal posture results in chronic repetitive strain which overcomes the joints and muscles of the neck and upper back resulting in Text Neck – neck pain, shoulder pain and headaches. The normal curvature of your neck is designed to distribute the weight of your head (approximately 10-12 lbs.) evenly amongst the 7 cervical spine vertebrae in your neck. 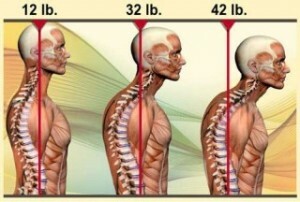 Forward head posture is the location of your head relative to your center of gravity. The further away your head moves from your center of gravity, the more your cervical spine straightens and the greater your head weighs on the lower neck vertebrae, discs, joints and muscles. This is the beginning of spinal joint and disc breakdown leading to degenerative arthritic changes and myofascial muscle strain. This chronic repetitive stress plagues our bodies over time and results in many neck and upper back conditions commonly found in our society today like arthritis in the lower neck, discogenic neck pain, stenosis, thoracic outlet syndrome (TOS), myofascial pain syndromes and tension-type headaches. What Should You Do to Maintain Better Head Positioning? Forward head positions increase greater loads on the neck and strain the upper scapular and shoulder muscles. Stand up with your upper back against a wall and ask someone to see how far away the wall is from the back of your head. If your head is more than 2 inches from the wall then you should start a posture correction program. Simply taking more breaks or spending less time on your phone, tablet or laptop provides your neck and shoulders with less tensional strain and greater periods of relief throughout the day. Much like an ergonomic working environment, it is ideal to view your screen at eye level to reduce constant forward bending so try to hold your devices to keep your head upright – this will help with the next point. When it comes to real estate – location, location, location! When it comes to your spinal health – posture, posture, posture! Simply sitting up straight and maintaining good posture will relieve your neck and upper back from the strain of being hunched over. So keep your head upright, tuck your chin in, bring your chest up and move your shoulder blades slightly closer to your spine. Stretch your neck, upper back and chest muscles often (2-3 times a day). If you have a forward head position and a stiff, achy neck, it will also be necessary to strengthen your neck and upper scapular muscles. Utilizing chiropractic care, physiotherapy or massage therapy treatments are great tools that will help improve your spinal joint movements and reduce muscle strain to limit the effects of forward head postural strain and degenerative aging. If you have concerns about your posture or are having recurrent neck and shoulder pain and tension headaches, book an appointment with a chiropractor, physiotherapist or massage therapist to have an assessment and begin a corrective postural program – as with most things in life, change begins with you taking the first step towards better living and wellness. We are available Monday to Saturday. We have early morning and extended evening hours to accommodate your schedule. Please call to book an appointment.